"Isn't it wonderful, being in love?""No." It feels like the rope is back around my throat, cutting off my air supply.I have at least one thing in common with Araby - her love story was choking me also.What the heck happened with book 2? It was as if everything I found exciting and infectious (pun intended) about Masque of the Red Death was distorted and lacking this time around.The love triangle didn't bother me before. In fact, I rather enjoyed it - because the story itself was not suffocated out by the love triangle. 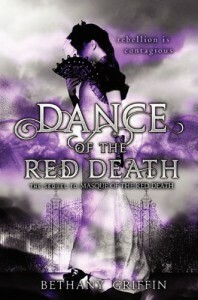 I wish I could say the same thing about Dance of the Red Death. It took me well over half of the book before I was finally able to see the creepy Poe inspiration at work. When the story turned dark, it was dark, but GAH...it took so long to get there! I do admit to being impressed that the party scenes were on the money and held up well with the new spin, but the male posturing which came first was awkwardly embarrassing. Who let Edward and Jacob in here?One of the personal notes that I took while reading : Araby, have you lost your damn mind?!?!? Yes, I did use all of that punctuation. She had bigger fish to fry and seemed forget that at key moments.But there was a crocodile mention or two, which was appreciated. Please excuse me if my feelings appear to be far more jumbled than they were when I took the time to write a proper review for book 1. If anything, this would reflect my overall view of how this duet ended : scrambled, bizarre, lovely at times, creepy at times....good enough, but it could have been so much better.